I just watched our Boyhood screener. 2) Oh my gosh, my own kids are going to grow up so stinkin fast. I was just a kid myself, going through all the awkward growing up experiences. And here I am on the other side as a parent myself now. My parents were just me and now I am them. Time is so unfair. 3) I’m two drinks in right now. This may be why I’m being overly sentimental. 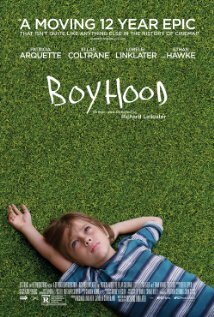 Can we have a Boyhood 2 now? That covers the 20s-early 30s please? Either way, Boyhood is great. Go see it. I liked the movie and I loved the way they used the same humans for the whole movie. But I kinda hated the end. And I wanted to know what happened to those kids from the mean dad. But the movie was pretty good. And to be honest I never got the point why it’s so special to use the same characters. What about Harry Potter? haha! I think that what was “special” about using the same actor is just that it seemed very genuine to see a child grow up. Whereas typically, when telling a story that spans a childhood or large age range you have to use different actors – this time we, the audience, were better able to ‘relate’ to the story because it felt a little bit more real.